Service Rank and Number / Rheng gwasanaeth a rhif: Lance Corporal No. 3005. Ref No Grave or Memorial / Rhif cyfeirnod bedd: 116. Died at home from head wounds received whilst serving in Mesopotamia. 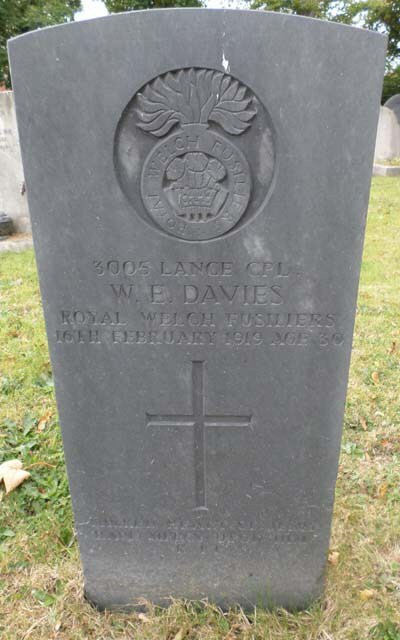 William Edward Davies was born in Rhyl, Flintshire during 1889. Prior to his enlistment in 1916 he lived at 26 Princes Street, Rhyl, Flintshire with his mother Mrs Mary Davies. He is also remembered on a Remembrance plaque at The Royal Alexandra Hospital, Marine Drive, Rhyl, Flintshire and The North Wales Heroes Memorial Arch, Deiniol Road, Bangor, North Wales. There is a Flintshire Roll of Honour Card for William Edward Davies at the County Archives Office, Hawarden, which was completed on 28 October 1919 by his mother.